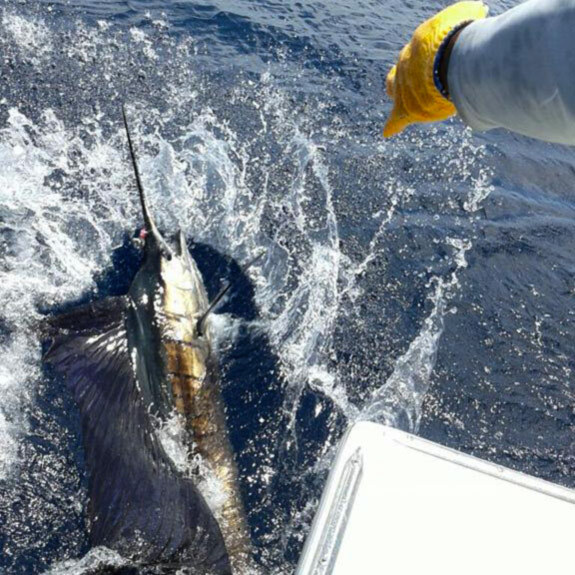 Catch marlin, sailfish, roosterfish… on a fully equipped Quepos fishing charter with professional captain & crew. Our overnight FAD trip on the Caribsea exceeded all expectations. The crew was very hardworking, professional and friendly. They made us feel right at home, put us on fish and kept our belly’s full of great food. I’m from Florida and fish every weekend and this was the best day of fishing I’ve ever experienced. Caribsea, Quepos fishing charter—the local legend of Costa Rica! 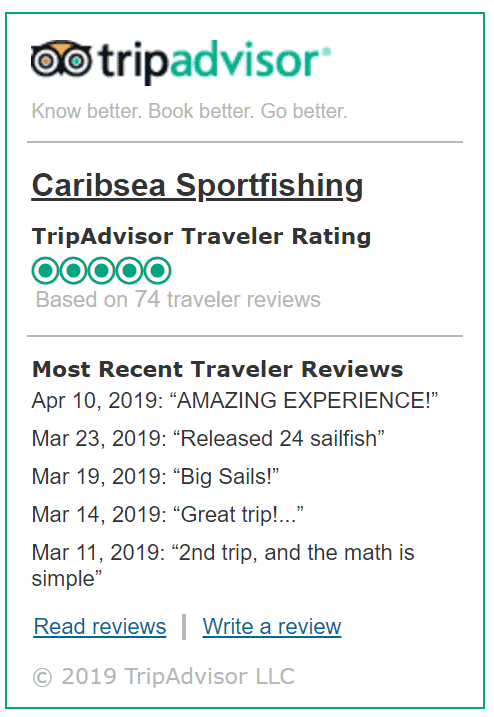 Caribsea, Quepos sportfishing charter offers world class inshore, offshore and overnight fishing trips to the most fertile fishing grounds of Costa Rica. Whether you are new to the sport, a weekend worrier or tournament angler, you are sure to have a great day on the water. Quepos is located in the central pacific of Costa Rica and this area of Costa Rica offers excellent sport fishing year round. We typically have flat calm seas and great year round weather. Average run time to the fishing grounds is 45 minutes to 1.5 hours unlike other parts of the world where it takes hours and sometimes days to get to the fishing action. We shared fishing seasons chart and other details on fishing Quepos here. Offshore, inshore, seamounts… what’s the best option? For the best fishing experience we only offer private charters. Deciding on inshore, offshore or overnight, depends on the type of species you want to target and the overall experience you are looking to have. Any trip can include bottom fishing, trolling, or a combination of both. Bottom or inshore fishing allows you to target species like roosterfish, grouper, red snapper, amberjack, and cubera snapper. Offshore or overnight trips allow you to target are pelagic species like blue marlin, black marlin, sailfish, yellowfin tuna, dorado and wahoo. 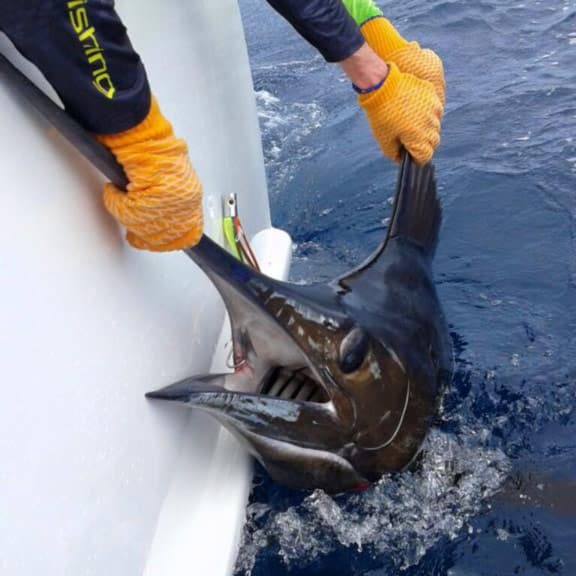 Why Caribsea, a Quepos fishing charter? Caribsea is a meticulously maintained 46’ Guthrie Sportfish. Originally built in the Carolinas, and brought to Costa Rica in the 90’s for one purpose only! 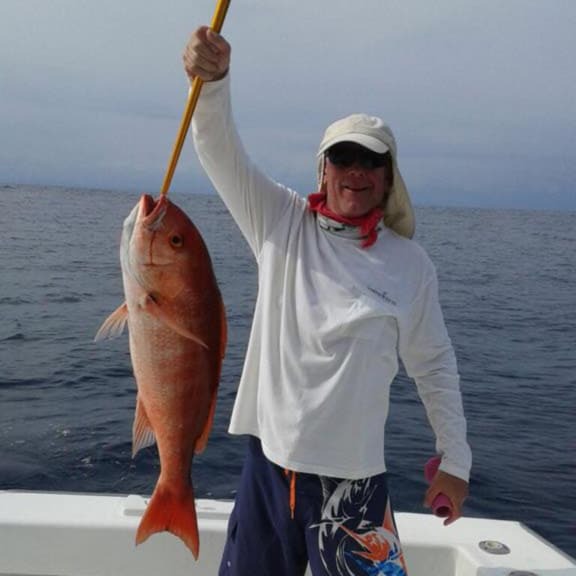 Deliver world class fishing experiences in the fertile waters of the Costa Rica. Caribsea sports a 15.5’ beam, making the perfect fishing platform for the calm waters of the Central Pacific. Full AC cabin, bathroom, bilingual crew, top of the line Garmin and Raymarine electronics! The boat is equipped with 30# – 80# Shimano reels, Connolly custom rods, tuna tubes and outriggers. We also offer a full suite of fly fishing equipment by Billy Pate and Sage. Caribsea is powered by a single Detroit 8V92 delivering the perfect balance of power and clean water to get you comfortably and quickly to the fishing grounds. Enjoy a short video of catching blue marlin aboard Caribsea, shot on a recent FADs fishing trip. We provide everything you need to fish! Bait, ice, tackle, fishing equipment, food–a hot meal, and drinks. You will buy fishing licence on the dock, right before you board. What would be the best trip for you? 6 hour trip, designed for the novice fisherman, families with young children and groups just pushed for time. They are easy to fit into any hectic vacation schedule. Trips are 8 hours in length, perfect for more avid fisherman that want to experience offshore fishing and catch some larger fish. These 10 hour trips are designed for the true fish enthusiast. They typically involve deep water bottom fishing and offshore trolling. These trips range from 24-72 hours. Extreme fishing at it’s finest! They trips typically involve deep water bottom fishing, offshore trolling, swordfish fishing and tuna fishing. Give us the details of your trip and we’ll make sure you get the fishing experience of a lifetime. And no worries, If you are looking for a smaller or larger Quepos fishing charter, please let us know as we have an entire range of affiliate boats we recommend and use as well.